There are many areas of public morality in which the Japanese excell. One of these is the relative absense of theft. 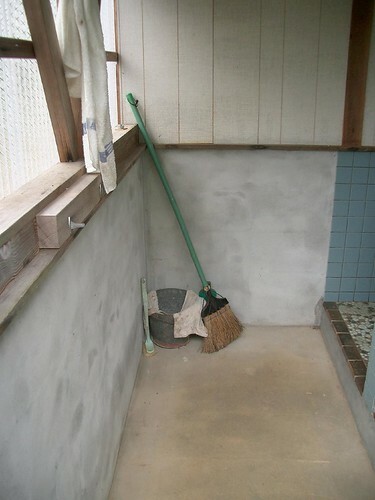 For example it used to amaze me how Japanese can leave cleaning products in public places, such as in the public toilet above, and that no one steals them. The bucket, broom and cloth toilet brush and bleach are perhaps too old and dirty for even Britons to whish to steal them, but placed as they are in an unlocked and isolated public toilet, I predict that they would not long remain intact in the UK. If things are not locked up or nailed down, then they are either stolen, or if they are of little use then they would be destroyed, destroyed. In the UK, if no one was interested in stealing the broom then someone would probably use it to beat in the windows of the toilet, then break it in half and then throw it into the bushes. Cleaning products and utensils for cleaning such as these can be seen left in toilets, shrines, parks and even bus stops. But there are some crimes that the Japanese seem to be into such as pork barrelling, confidence trickery, "dangou" cartells, reading books before purchase, and speed limits are liberally interpretted, as are of occasion are the constitution, international treaties, and marriage vows. All the same though, I generally believe in the moral superiority of the Japanese!